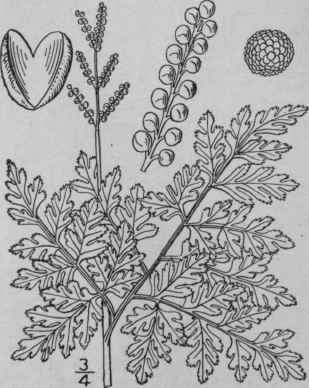 B. silaifolium Presl, Rel. Haenk. 1: 76. 1825. Botrychium ternatum subvar. intermedium D. C.
Eaton, Ferns N. Am. 1: 149. 1878. B.occidentale Underw. Bull. Torr. Club, 25: 538. 1898. Leaves single or sometimes two, 8'-18' long, thick and fleshy, coriaceous in drying, glaucous, the common stalk short and stout, wholly under ground; bud silky pubescent, the sporophyl and sterile blade both bent down. Sterile blade broadly triangular or subpentagonal, 4'-8' broad, nearly as long, subternate, the stalk 1'~4' long, the basal pinnae large and 3-pinnate, the ultimate segments numerous, ovate to obovate, obtuse, cuneate, ad-nate, the margins irregularly crenulate; sporophyl 2-5-pinnate, long-stalked, stout and diffuse. In moist meadows, sandy pastures and borders of low woods, northern New England to British Columbia, Oregon, Idaho and Minnesota. Aug.-Sept.
Osmunda lanceolata S. G. Gmel. Nov. Comment. Acad. Petrop. 12: 516. 1768. B. lanceolatum Angs. Bot. Notiser, 1854: 68. 1854. Leaves 2'-12' long, fleshy, the common stalk nearly all above ground, long, usually three-fourths the length of the plant; sporophyl bent down in the bud, the sterile blade recurved upon it. Sterile blade sessile, 3/4'-21/2' broad, nearly as long, either subternately parted with divisions acutely pinnatifid, or broadly deltoid, with 3-4 pairs of deeply pinnatifid pinnae, the segments ovate or ovate-oblong and lobed; sporophyl short-stalked, 2-3-pinnate, the branches usually stout and diffuse. In meadows and moist woods, Nova Scotia to Alaska, New Jersey, Pennsylvania, Ohio, Colorado and Washington. Europe and Asia. June-July. Osmunda rirginiana L. Sp. PI. 1064. 1753. Botrychium virginianum Sw. Schrad. Journ. Bot. 18002: 111. 1801. B. gracile Pursh, Fl. Am. Sept. 656. 1814. 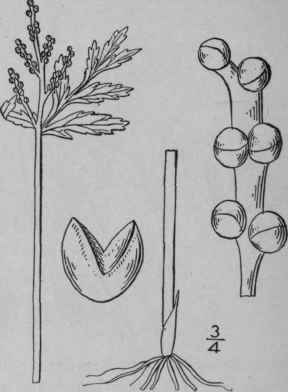 Leaves 4'-2 1/2o long, the common stalk slender, nearly all above ground, comprising one-half to two-thirds the length of the plant; bud pilose, both the sporophyl and sterile blade wholly bent down. Sterile blade nearly or quite sessile, spreading, membranous, deltoid, 2'-16' broad, nearly as long, ternate, the short-stalked primary divisions 1-2-pinnate, the numerous segments 1-2-pinnatifid, the ultimate segments oblong, toothed at the apex; sporophyl long-stalked, 2-3-pinnate. In rich woods, Labrador to British Columbia, Washington, Arizona, and the Gulf states. Mexico, Europe and Asia. June-July. Rattlesnake-fern, Hemlock-leaved-moon wort.